Hours: 9:00AM - 6:00PM Est. Time Open: Mon. 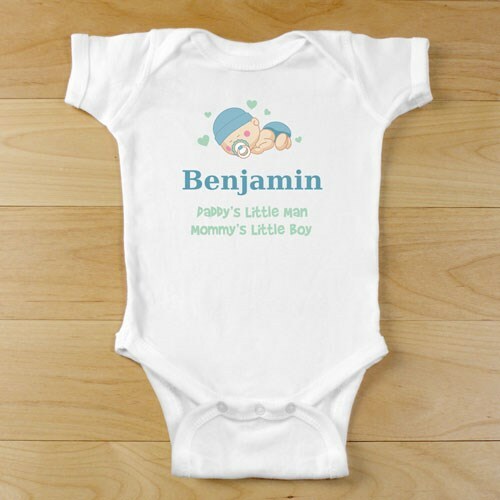 - Fri.
Personalized Little Sleeper Boy Baby Infant Creeper. This baby creeper is so cute and adorable for your little baby. This creeper you can have your little one to travel with you any where and still look so adorable in it own personalize outfit. Your grandma and grandpa and family members will love the baby creeper or t-shirt so much. Have your little one look special at home or when you travel to family and friends house. Sign up for our Email List today & be the first to hear about our specials and promotions!